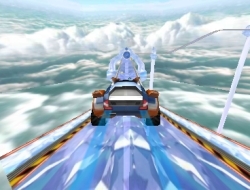 This driving game is really thirlling and it will please you to know that the races are all taking part in the sky on transparent platforms. The flying sensation is even greater once you find out that there are huge jumps you need to land in order to get good lap times. Choose one of the four cars and then start your championship. For each race the going will get tougher as you will need to finish higher and higher in the rankings to qualify for the next leg. Collect as many coins as you can to increase your score and later on submit it to compare yourself with your friends all over the world. Use the arrow keys to drive your futuristic car. Age of Speed 0.00 between 0 and 10 based on 0 votes.